By 1890, some 24 years after the formation of the Derwent Angling Association, it seemed as though at last the club was entering a period of relative stability. Despite recent expenditure on the stocking of both trout and grayling into the River Derwent, the association was again in a strong position financially and apparently now winning the war on both fronts against the twin evils of poaching and pollution. The minutes from the AGMs held in the late 1880s and early 1890s make almost bland reading compared to the anxiety and zeal so often evident at meetings staged over the previous 20 years or so. They contain precious few references to serious incidences of poaching – about the most shocking offence being the expulsion of one member for ‘taking orders’ for the trout he expected to catch by fair and proper means! And despite the coal industry in North West Durham nearing its zenith in terms of production and the numbers of deep mines, major pollution incidents on the scale of 1868 were no longer being recorded. Moreover, the lead mining industry, which had blighted the upper reaches of the Derwent for almost two centuries, was now entering a steep and terminal decline. Circumstances usually dictate that any organisation is going to need time – a considerable amount of time in most cases – to right the wrongs that it was set up to tackle. Governments rarely succeed, even those gaining multiple re-elections, and most NGOs fizzle out for want of support once it becomes clear that their goal is unachievable in the short term. Indeed the DAA had drawn criticism from within its own ranks in the early days over its apparent lack of progress on the key issues of poaching and pollution. Yet instead of walking away, most of those dissenting voices had ultimately become members of the committee, pooling collective knowledge and local determination, and pushing the association on towards the brink of its aspirations. Most of the founding members of the association had by now passed away, but the figure of John Booth still stood head and shoulders above the rank and file, original Honorary Secretary and, by 1890, a much respected President of the organisation. Now in the autumn of his years, Booth was not about to act merely as a figurehead, however. Quite the contrary, he frequently came over as a rod of iron at AGMs, keeping order in discussions that could still at times get quite heated! Indeed he would even steer association policy in certain circumstances – flying in the face of accepted wisdom on one occasion. Back in the late 19th century, the killing of herons, in common with other perceived ‘vermin’, was common practice on trout streams such as the Derwent. Association accounts record the payment of gratuities to river watchers who could prove that they had shot the birds (two shillings and sixpence per heron), but it was John Booth, at the 1892 AGM, who moved that the killing of heron and other wild birds be discontinued. The motion was carried unopposed and the association added another article to its constitution: that of conservation. John Booth died in 1897 but his legacy lives on over a century later in the form of the modern Derwent Angling Association. When you speak to those who remember, one of the most enduring features of the DAA in its halcyon years in and around the mid-20th century, is the way in which the club regulated and dispensed its membership. By then, the association was so oversubscribed that it had a considerable waiting list of prospective members, and while this hadn’t yet become an issue back in the 1890s, the process of enrolling members was nonetheless far advanced from the primitive methods employed back in 1866. By the end of the last decade of the 19th century, sellers had been appointed in all the key districts that came within the catchment of the association. The listed vendors at that time were as follows: Mr N Brown (Shotley Bridge), Mr R Frankland (Consett and Blackhill), Mr N Charlton (Ebchester), Mr Welch (Blackhall Mill), Mr R Hutchinson (Blanchland) and Mr G Weedy (Lintz Colliery). A system had also been introduced whereby junior members (those under the age of 17) could apply for tickets at a reduced rate. New regulations governing fishing on the Derwent had also been introduced by the 1890s, although the changes were subtle and took place over time. The size limit for takeable trout and grayling was increased to six inches (and in the following decade to seven inches), with the requirement that all members had to carry their tickets at all times while fishing. In addition to the traditional ‘one hour after sunset and an hour before sunrise’ exclusion, the obscure subject of fishing on the Sabbath was cleared up once and for all – fishing on Sundays was not allowed – and the association’s first official season for grayling fishing was established, commencing on 1 July and running through to the end of the trout season in November. ‘Wandering into the woods’ while fishing association waters was now deemed to constitute trespass; and companions who were non-members (whether fishing or not) were banned, including dogs. Many of these new regulations covered contentious areas within the law by which those members intent on poaching game on adjoining land had hitherto gone unnoticed. By the start of the new century, the association was ready and able to embark on its next grand scheme to restock the river. In 1901, against a taking of £14, 7s – including the proceeds from a competition held at the newly constructed Waskerley Reservoir – the sum of £13, 10s was reinvested in ‘young fish’ (1,000 ‘Levensis’ yearlings from Howieston Fisheries in Stirling) to be introduced into the river in February 1902. This number was repeated in 1907 and 1908 (when 500 ‘fario’ [brown trout] were introduced between Shotley Dam and Allensford, and 500 ‘levensis’ stocked near Ebchester). In 1909, 2,000 more yearlings were released in March, 600 between Blackhall Mill and Ebchester, 400 at Hole House, 400 at Ravens Crag and a further 600 near Muggleswick. As the second decade of the 20th century dawned, the association continued in this vain, stocking with 1,000 two-year-old brown trout at the start of both the 1910 and 1911 seasons. One thousand more were introduced in November 1911, with the locations and numbers in the spring of that year listed as: “4 cans (milk churns containing the trout) at Milkwellburn, 4 at Postwick Mill, 3 above the dam at Ebchester, 3 also about the Spa, 3 at the Paper Mill dam, 3 at Hole House, 6 about Allensford and 4 at the stepping stones (Muggleswick)”. The procurement process had by now been greatly simplified as fish were obtained from the famous North of England Fish Hatchery at nearby Barrasford, on the banks of the River North Tyne. Records show that £22 was paid to the Barrasford fishery in 1910, with the association declaring an extremely healthy balance of £105, 10s, 9d. £37 alone came from that year’s ticket sales to a membership now approaching 200 and the general mood emanating from the association could best be described as upbeat. Plans were even raised to establish the association’s own hatchery in a pond owned by long-time club benefactors, the Annandale family, with the ‘Waskerley Match’ now a regular fundraising event in those apparently carefree years of the early 20th century. But events far away – and some quite close to home – would soon rudely interrupt this happy-go-lucky period. If the onset of the world’s first arms race wasn’t enough, with the Anglo-German scramble to build dreadnought battleships swallowing up ruinous sums of public money, the tranquil peace of the Derwent Valley itself was shattered on 11 October 1911, with the shooting of Lintz Green stationmaster Joseph Wilson, in one of the most infamous unsolved murder cases in North East history. No killer was ever found – the principal suspect released unconditionally from Durham Prison on the eve of his trial for want of evidence. Soon the mood everywhere became a depressing mix of gung-ho jingoism and grim reality as the entire continent of Europe slipped inextricably towards the horrors of World War One. To start with, it was business as usual, however, as many people refused to believe there’d be a war – or that if there were, the Allies would be in Berlin within months. As the committee pondered their own seemingly insurmountable goal of obtaining the fishing rights “all the way to the Tyne”, a side note from the minutes of the 1913 AGM tasked the secretary with the job of visiting Barrasford to order 5,000 yearling Loch Leven trout “to be forwarded at the next suitable date”. In an early example of an upcoming fad, in February 1914, the committee then moved that “500 two-year-old Rainbow Trout be placed into the river below Ebchester no later than March this year”. The rainbows were duly procured from Howieston Fisheries in Scotland just before the outbreak of hostilities in the summer of that year, but in time it would be realised that the introduction of this particular North American species would be of no greater long-term benefit to the River Derwent than the abortive brook trout idea had been some 20 years previously. With casualties on the Western Front starting to mount up, it wasn’t long before the reality of the terrible situation in northern France hit home. The DAA’s 1915 AGM carried a motion concerning “members absent serving their country: that their tickets do not lapse, but that they be allowed to fish whenever they are home on leave for free”. This statute remains on the book to this day and is one that Derwent Valley anglers serving in both the recent Iraq and Afghanistan campaigns have been able to take full advantage of. The terrible cost of the war on the continent can be seen in continued references in committee minutes. In 1915, the association pledged five Guineas to The Prince of Wales Fund (a charity supporting hospitals in London), while in 1919 it donated £5 to the Red Cross Fund. At the 1916 AGM, it was recorded that “a note of condolence had been sent by the association to the widow of ‘respected brother angler, R. Dixon’ ”, the only member listed in official correspondence who appears to have lost his life in active service between 1914-18. A further £5 was given to the Red Cross in 1917, with a request that it be “devoted to those members now serving with HM Forces”. Ticket sellers were permitted to supply the names of any dependents of servicemen fallen or missing so that they might receive a share. Nonetheless, the DAA continued in its primary role as an angling association throughout the four years of the Great War, in 1915 introducing 2000 more fario and levensis, procured once again from Howieston. At the end of the war, the association revived its trout stocking policy with 2,000 yearling trout supplied by the Eden Fish Hatcheries of Armathwaite, Cumberland, and a further 1,000 from Howieston. The fish from Cumbria were released in several of the locations used previously on the upper river, while the Howieston trout were destined for the lower waters: 500 for Ebchester and 500 for the mouth of the Milkwell Burn. In sharp contrast to the bloody imperial wars waged in the first two decades, the third decade of the 20th century would be characterised by principled civil strife, and in a kind of forewarning, the early 1920s saw the first serious threat to the existence of the DAA. A conflict of interests, interrupted by the First World War, had been simmering for some years between the association and the Tyne Fisheries Board over those parts of the River Derwent downstream of Lintzford, over which the club had never gained any real sort of control. Deputations on certain stretches of the river below the village of Rowlands Gill had been promised in the past, and while members did fish these areas under the auspices of their DAA ticket, doubts had been raised about the legality of such actions in recent years. Various Acts of Parliament had by now initiated an embryonic system of fisheries management – the first step on the path towards the arrangement we now know today, whereby a river’s ‘fisheries board’ became the principal regulator of all fishing within its own delegated river system. While traditional riparian rights were not in question (including those leases held by the DAA), the Tyne Commissioners now sought to introduce a rod fishing licence for the entire River Tyne catchment, including those parts of the Derwent long controlled by the association. It thus began to send its river keepers up the tributary (initially just to the lower reaches) to inspect the credentials of any angler found fishing there. The first real trouble between the DAA and the TFB erupted when the latter threatened to prosecute association members caught fishing without a licence on DAA-controlled stretches. The association responded, via an extraordinary general meeting held in April 1920, with the declaration that the TFB should “keep their keepers off the Derwent on pain of prosecution”. It also vowed to defend any member threatened with litigation by the Fisheries Board after the Tyne Commissioners demanded that they “pay licence”, and furthermore pledged to meet all expenses incurred. The matter came to a head when a Mr Oliver was summoned to appear before Hexham Magistrates in May 1921. As promised, the association hired a solicitor to defend their member and even arranged the hire of ‘a motor’ to take the accused to be interviewed by his brief and to take both defendant and a defence witness to court on the day of the trial. From the entry in the minutes of the next committee meeting on 14 May, however, it is clear that Mr Oliver’s case was lost and that an appeal, while supported by half the committee members present (the secretary cast the deciding vote), was deemed unlikely to succeed. By the narrowest of margins, the committee decided to sue for peace with the Tyne Fisheries Board and avoid the potentially damaging cost of any further legal proceedings. It is always difficult to cast reasoned judgement on an issue where only one side of the argument is open to scrutiny. However, for a body like the Tyne Commissioners to act in the way it did, having shown no interest in the well-being of the River Derwent at the time of the DAA’s formation, can only be interpreted as heavy handed. For the DAA of the 1920s, however, with little prospect of any popular uprising in the name of angling – or of any kind of political support – there was no alternative but to attempt to build bridges with the Tyne Commissioners. Accommodations were duly reached on the first two articles. However, a group of anglers from the Axwell Park Colliery near Swalwell were about to make their own move for the fishing rights on the lower river. By the mid-20s, the association’s waters had calmed once more, trickling towards the Tyne at a far more sedate pace than the turbulent flows of recent times. The DAA continued to stock the river with trout – a total of 1,000 levensis and fario (still seen as separate species!) being stocked in each of the 1922, 1923 and 1924 seasons at various locations between Lintzford and Eddy’s Bridge. In 1925, the association celebrated its Diamond Jubilee – its gold anniversary, ten years earlier, having been somewhat overshadowed by the events of the First World War. Fishing on the Derwent had come a long way in the DAA’s first 60 years but there was still much work for the organisation to do. In 1926, following reports that “poaching, fishing outside of allotted hours and the taking of trout and grayling less than the minimum permitted size” were all becoming rife, the association decided to appoint its first water bailiffs, initially six named club members, appointed and provided with special badges of office. It was stated: “it will be the duty of these bailiffs to intercept any persons angling the river and demand the production of their licence and, at the same time, examine any fish in their possession in order to see that the regulation as to size is being adhered to.” In the years that followed, the numbers and titles given to these ‘bailiffs’ would be much altered but the basic principle would remain. Representative office would also come to the association as a whole, with the relationship between it and the Tyne Commissioners warming considerably as the 1920s progressed. By the end of the decade, it was becoming clear that the association’s marriage of convenience to the Tyne Fisheries Board was anything but the shotgun wedding many had believed it to be! While poaching was mostly only of ‘nuisance value’ by this time, pollution now posed a threat, while sporadic, sufficient to eradicate all fish life within the River Derwent in the event of any single catastrophic incident. By the late 1920s, the scale of heavy industry in the North East had changed dramatically since the DAA’s formation over 60 years earlier. Industrial land-use in the Derwent valley had progressed, rather than changed completely, and while the lead mines in the upper valley were now but a fairly distant memory, coal mining was still the dominant business of the area, with the pumping out of extensive and often interconnected deep workings contributing an ever-increasing problem with mine water. In addition, the iron works at Consett had now also been transformed into a much larger steel-making complex, complete with its own accompanying coke works; the foundry at Winlaton Mill on the lower river having been replaced completely, in the mid-20s, by another coke works (Derwenthaugh) to feed the steel industry’s insatiable demand for fuel. Even the long-established paper mill at Lintzford had now been converted to an ink factory, with its own particular effects on the quality of the water in the lower river. On 5 May 1927, a sample of river water was taken from the Derwent at Blackhall Mill, following repeated complaints about pollution entering the river from the nearby Hamsterley Colliery. The sample was sent to the Tyne Commissioners with the request that they “draw the attention of the Hamsterley Mining Company to the state of the river at this point”. Similar pollution, carried by that perennial casualty, the Pont Burn, was suffered by the newly-established Axwell Park Angling Association, which now controlled water on the river below Rowlands Gill – the culprit in this case the inappropriately named Derwent Delight Colliery near Dipton. In time, strength in numbers would help all anglers in their struggle against the evils of industrial pollution, but it would be a long hard road. The coming years would see a recurrent problem that would blight the river for the best part of three decades. Throughout the 1920s, the DAA had continued to seek assistance from the Tyne Commissioners over pollution issues, but it was also their stated intention to gain a foothold within the commission itself. As early as 1922, they had requested Derwent representation on the Board of the Commissioners and in 1927 they asked that committee member Mr Ralph Anderson be appointed an Honorary Tyne Bailiff. By the end of the decade there was even some accommodation between the two organisations regarding cooperation in the matter of trout stocking into the Derwent, allowing the association to avoid considerable outlay in certain years, although the great majority of trout stocked into the river were still sourced and paid for by the association. With increasing trout stocking densities, there came inevitable calls for more stringent rules, and it was at about this time that the DAA inadvertently introduced its first ‘fly fishing only’ rule on association waters. Up until then, while the DAA had ostensibly been a game fishing club, there was nothing within club literature to suggest any restriction in what was considered fair means for angling. In fact, with its membership being predominantly working class, it appears that up until the 1920s the vast majority of DAA members fished for their trout with a worm! That was until a dispute with a Colonel Clifton-Brown, landlord of the Ruffside Estate, who sought to terminate the association’s lease on his stretch unless he was allowed to introduce his own set of rules for fishing. Within the ten-point edict he dictated, it was now specified that fishing in the waters between Blanchland and Espershields Bridge was to be restricted to fly only. It was a landmark ruling. In time, as fly fishing skills spread through the entire angling population of the Derwent Valley, this rule would be extended, and by the middle of the next decade it was evident that fly fishing for trout had become de rigueur among many of the association’s members. In 1938, a fly-tying competition was initiated, for which each member was invited to tie a dozen flies, either traditional patterns or their own creations. The winner was awarded five shillings – the cost of a season ticket – and the competition survived for over 30 years, undoubtedly helping to establish a tradition of fly-tying among the angling public of the area. The push towards fly fishing was even extended to the grayling, as while trout were of course the staple of the majority of members, the ‘lady of the stream’ now comprised a sizable proportion of the fish in the river. In contrast to some North Eastern angling fraternities, grayling were never considered a pest on the Derwent, although at times there had been concern over the extent to which they had spread. The grayling season had never really been standardised though – having run both concurrently with, and begun and ended after, the traditional trout season of March to September – and calls for its permanent extension into the winter months were championed at the 1938 AGM. Mr JP Allerston reasoned that “the number of grayling in the upper reaches, particularly at Millshields, is to me rather alarming. Although I do admit to the sporting capacity of this fish, I should not like the Derwent to suffer the same fate as other north country rivers”. The season was thus extended – by fly fishing only – until the end of December in each year. The stocking of trout on association waters continued unabated, despite the financial constraints of the great depression in the early 1930s. At the start of the 1930s, in contrast to the rest of the world, the DAA was declaring a healthy yearly balance (of £120), and as long as the cost of 1,000 yearling trout from the now amalgamated Tyne & Eden Fish Hatcheries stayed at £22, the practice remained financially prudent. 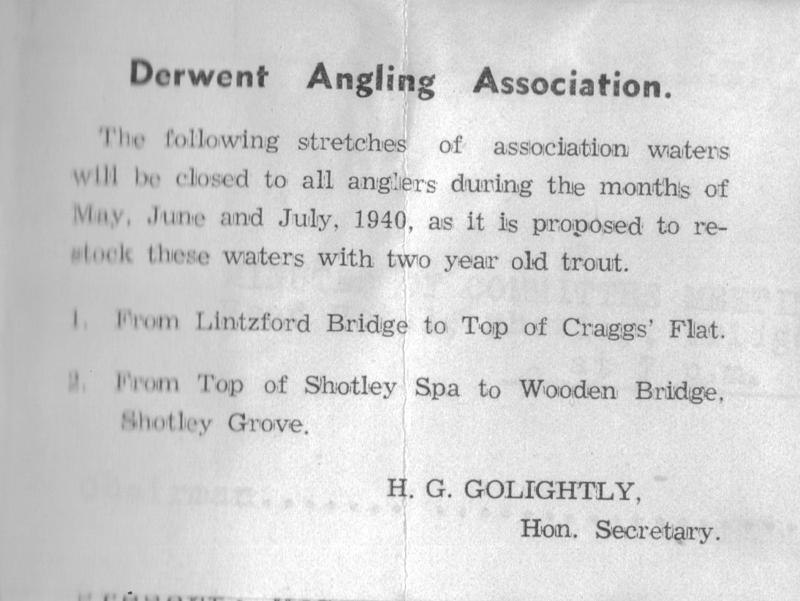 At the AGM in 1932, the matter of leasing the old bathing pool at Shotley Bridge from the Annandale family had once again been raised for the purpose of experimenting with the rearing-on of stock fish and, in a manner recommended by the Fishing Gazette, 150 of the 300 yearlings received that year from the Tyne Fisheries Board were placed in the pool. These trout were ultimately released into the river at the end of the season and the experiment continued throughout the rest of the decade, with the stock density increased by 50 trout each year. While the association’s own finances remained healthy, the plight of many people in the Derwent Valley was quite different by now and renewed poverty caused by the economic downturn did cause certain individuals to go to quite extraordinary lengths to steal trout from the river. In committee minutes from 1933, the case of a bizarre (and fatal) poaching incident was discussed, in which a Mr Brown was killed while attempting to explode dynamite to kill trout in a pool near the old lead workings on the upper river. However it was still pollution that posed the greatest danger (to the fish in the river at least!) 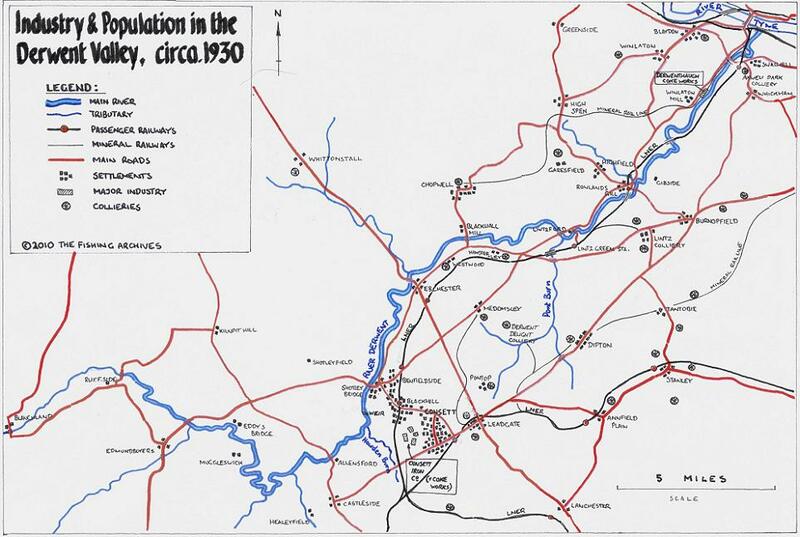 and the next serious pollution incident, caused during the summer of 1933, saw raw sewage discharged from the Consett Urban District Council outfall combining with low river levels to kill thousands of fish between Shotley Bridge and Ebchester. The matter was brought to the attention of the TFB, who raised it with the fledgling Ministry of Agriculture and Fisheries. Letters from both MAF and Consett UDC were read out at the next committee meeting in August, along with a damning report on the toxicological analysis of a sample of river water, submitted by the Dove Marine Laboratory at Cullercoats. An inspection of Consett’s sewage treatment works was arranged and the matter left in the hands of the TFB, with compensation eventually awarded to the tune of £50 for restocking. Even in the light of successful prosecutions, the harm done to the river by sewage and ‘rogue’ industrial dischargers only got worse as international tensions rose and the war years of 1939-45 loomed. Although the TFB remained a pillar of strength in the common crusade towards the cleaning up of the Derwent, it already appeared by the late 1930s that the MAF was prepared to take an unduly relaxed line with the polluters. The onset of World War Two only made matter worse. Early German successes in Europe meant that the six years of the Second World War were far more chaotic for the population at home, both in terms of infrastructure destroyed by bombing and the economic constraints of a far more effective enemy blockade. By 1943, the pollution situation on the Derwent had become so exacerbated by the war effort that the DAA prepared a detailed summary of the pollution incidents caused over the previous 15 years. Association chairman Mr Golightly was quoted as saying “during the last forty to fifty years, the river has deteriorated enormously”, with the report also containing evidence that boiler sludge water from Chopwell Colliery was being pumped into the river near Blackhall Mill. Later that year, a serious pollution incident on the river below Shotley Bridge Gas Works was reported in the start of a problem that would last for the whole conflict. In a letter to the Tyne Fisheries Board, it was stated that it was “definitely within the knowledge of the association that the gas company has pumped poisonous liquor into the river without the slightest regard for fish life. It is evident that the greater part of the fish life over a very considerable distance below the gas works has been killed.” The association, with the support of the TFB, felt compensation was in order and a list of all the restocking undertaken since 1922 and costs incurred was supplied to the Tyne Commissioners in order to expedite a claim. Unfortunately, the ultimate responsibility to enforce any such penalty rested with the MAF, whom it was suspected “would not interfere”. 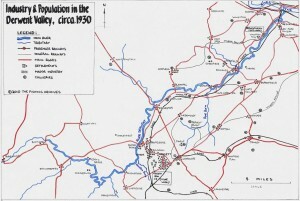 The pollution problems caused by the gas works weren’t resolved until after the war, when in 1946, having already commissioned chemical analyses of river water samples following further pollution incidents, it was discovered that creosote and tar oils were entering the river in that locality. Mr Craig, Head Bailiff of the TFB, carried out an inspection of the site and found that “creosote was periodically being pumped from tanks in the gas company’s yard, gradually saturating the surrounding land and ultimately finding its way into the River Derwent”. An undertaking was eventually given that settlement tanks would be installed on the site as soon as possible, but unfortunately, following another fish kill the following year, a prosecution was eventually brought before Consett Magistrates by the TFB. Although the case was dismissed (owing to the defendants’ use of a loophole in Section 8 of the Salmon & Freshwater Fisheries Act 1923) the Magistrates awarded no costs against the Fisheries Board, and impressed upon the gas company their desire to see a swift and proper introduction of measures to prevent further discharges. The apparent futility of pursuing such a claim was ultimately debunked when the court’s deliberations were used as a case in point to effect the removal of the spurious section of clause 8 from the Act. It wasn’t to be the last change in water regulations either. The end of the Second World War brought about a more profound change in British society reflected by a wave of new legislation passed by the Labour government elected immediately after the defeat of Nazi Germany. Among the changes proposed was what would become the first in a series of major alterations in the governance of fisheries and river management during the post-war era. The 1947 River Boards Bill was intended to co-ordinate the work of the hitherto independent Fisheries, Catchment and Drainage Boards, along with that of the pollution authorities, under a single umbrella body, the ‘River Board’. The Northumberland and Tyneside River Board was thus established and took over the responsibilities of the TFB in the same way that subsequent legislation would pass the baton to the Northumbrian River Authority, Northumbrian Water Authority, National Rivers Authority and ultimately the Environment Agency. The secretary of the Derwent Angling Association had reported to the commission implementing the changes on the sterling work done by the TFB and provision for future cooperation was anticipated. The DAA and the Tyne Fisheries Board’s relationship may have got off to a sticky start, but together they had played a fine innings over the subsequent quarter of a century. The next stage in the fight against those that would pollute the River Derwent was now at hand.